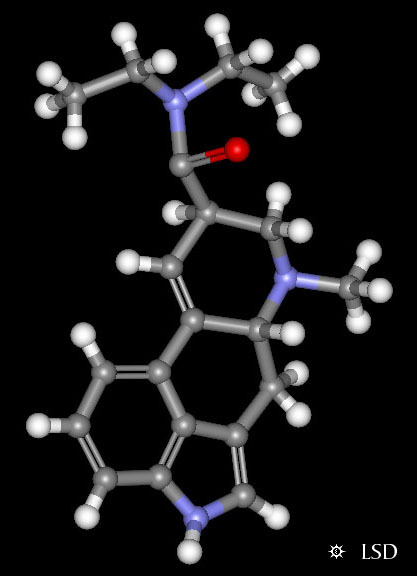 LSD stands for lysergic acid diethylamide. It is the most potent in the psychedelic drug family. Effects are felt when 25ug to 50ug doses are taken. However, it can be bought on the streets in 300ug doses, (ug is an abbreviation for microgram or one-millionth of a gram.) It is often sold as “glue” on the back of stamps and is to be licked off. Its effects are noted in 40 to 60 minutes and lasts for six to eight hours. Symptoms include dilation of pupils, increased blood pressure, pulse and increased reflexes, excess saliva and tears also occur. Colors are intense and shapes are altered due to effects on the visual system in the brain. Mood changes are frequent and unpredictable. These are commonly known as “good trips” or “bad trips”. LSD does not kill but suicides and fatal accidents occur during and after “bad trips”. Chronic use may cause persistent psychosis (inability to know reality) caused by permanent brain damage. Tolerance is not common but does develop after three to four daily doses. There are no withdrawal symptoms and the drug is not addictive—but a “bad trip” may require treatment due to extreme panic, fright or attempt to commit suicide. Flashbacks do occur and often consist of fleeting perceptions of colors and shapes that occur long after usage has stopped. This is also due to brain damage and may be permanent. There is a wide range of possible experiences produced by LSD. These depend on dose, setting, expectations, past experiences, and personality of the user. Early effects can include numbness, muscle weakness, muscle twitching and impaired coordination. Later effects include distortion of senses, time and thought processes. Street LSD is sometimes impure and may contain "PCP" or "speed". LSD use during pregnancy may increase the risk of spontaneous abortion and congenital abnormalities. Expectant mothers should never use any drug without advice from their doctors. Possession of LSD is illegal and can result in a fine of $1,000.00 or 6 months in prison for the first offence. A common misconception is that you see pink horses and cows when tripping on LSD. FALSE! You see trails (extended movement, where an object glides across field of view, leaving its color and part of its shape behind) and dots and sometimes lines. Remember, druggies lie like hell, because they want you to think drugs are cool and they are privileged to use them.